New Renault Megane from 13,995 | What Car? 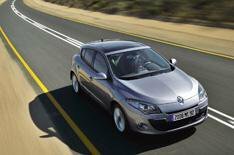 The new Renault Megane five-door hatchback will cost from 13,995 when it goes on sale in November. Three petrol engines and three diesels will be available. The petrol range will be made up of 98bhp and 108bhp 1.6-litre units and a 177bhp 2.0-litre. There will also be 85bhp and 105bhp 1.5-litre diesels, plus a 128bhp 1.9-litre unit. Trim levels are Expression, Dynamique and Privilege. All models will have air-conditioning, six airbags, front and rear electric windows, anti-skid control, stability and understeer control, heated mirrors, a CD player, keyless entry and a trip computer. Dynamique add 16-inch alloy wheels, except on the 2.0-litre petrol-engined model, which get 17-inch alloys, Bluetooth connectivity, automatic headlights and wipers, cruise control and front foglights. Privilege adds dual-zone climate control, electric-folding door mirrors and rear parking sensors. Cost options include stereo upgrades, leather upholstery, heated front seats, a panoramic sunroof, Xenon headlights and a sat nav system. A sports styling pack, featuring a body kit and spoiler, will also available.